Thought it would be cool to wear the heart monitor during a standard dentist appointment. Assumed there would be some spikes during the appointment as the gums were getting stabbed with sharp objects. No real spikes to speak during the actual appointment. The spikes I noticed are of me walking around the office and what I can guess is talking with the Doc at the end of the appointment. So nothing earth shattering here. but cool to get some stats from the heart monitor. The D3.js library is free and pretty powerful. I have struggled in the past to get it up and running but had a breakthrough today. Here is my email heatmap. This is showing when email hits my inbox. Saturday's @ 5pm are dead. Hours of power are 8AM ,9AM and 3pm. You can check out the library here: http://d3js.org/. They have tons of examples and such. Me and some other dudes try to run on Thursday nights to and from our Bible Study. We started back in August of 2013. Below are some stats about the various runs and such. We have two routes. 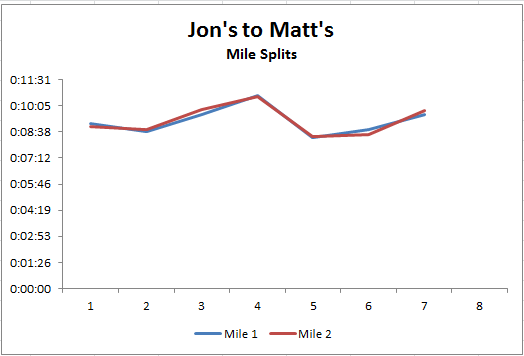 Matt's to Jon's is the first route and Jon's to Matt's is the second route. Typically we run faster on the first route. This could be explained by a couple factors. 1) fresher legs. 2) The route is easier, it starts off with a huge downhill section allowing you to break several land speed records. The second route includes a huge hill section in the middle and a hill on the final stretch. 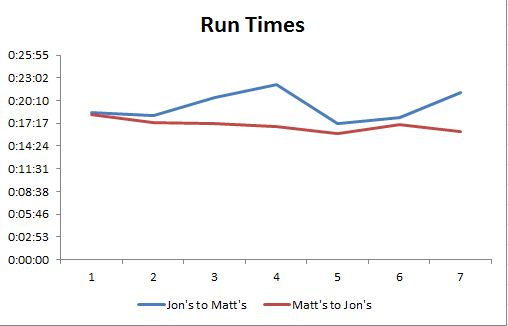 Overall Run Times again show that not only are the first route runs better, but they are improving with a downward trend in total time. 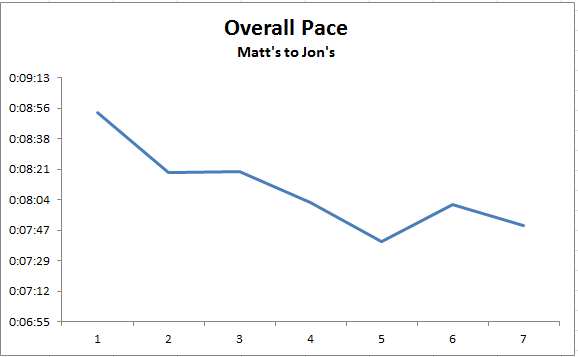 The trend appears to be moving up on the second route. Best guess on that is the weather. We have run on some cold, windy nights. Last night being the most brutal. 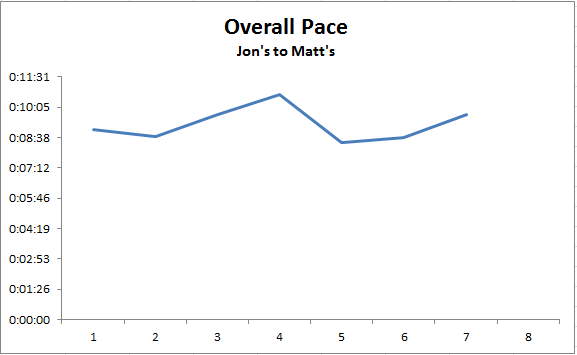 Here is a better graph showing the improvement in Overall Pace on Route 1. 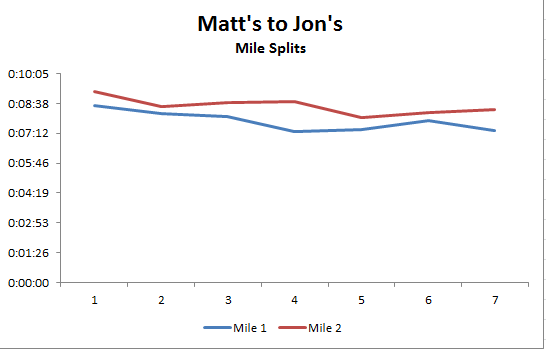 Finally here is a chart showing the mile splits for each Route. I am only showing Mile 1 and 2 since the distance is just over 2 miles. The Mile 3 split is only a minute or 2 and was removed. The first route is faster, more consistent (Standard Deviation of 45 seconds) and improving. The second route is more challenging, slower and not improving. The challenge is to keep running and get better on the second route. I mentioned last night's run was brutal. So brutal in fact that weather underground listed conditions unknown at 10:35PM. Probably due to the gale force winds! After the data was cleaned up I was able to run some queries. Focusing on First Down Play call tendencies in the First Quarter. Here is what I came up with. For total play counts I did the following. 59% of the time teams are calling a run play on 1st down from the plays in my sample. Here are the yearly stats. The percentages have remained pretty consistent over the past 10 years. I need to investigate the Total Play count drop in 2011. Not sure if that is a data issue or there really was a drop in total plays that year. Perhaps there were more penalties, sacks or something that was removed in my filter. Using the links above you could download the play data and start running your own queries and analysis. The 2nd Quarter contained the best balanced attack of all the quarters. 2002 and 2011 showed teams called slightly more pass plays than run plays on first down. Every other year run plays were called more frequently on first down. 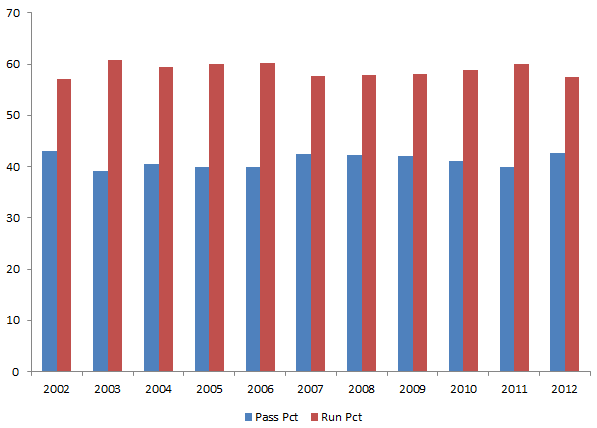 2006 had the biggest gap between Pass and Run play calls with 46.21% Pass vs. 53.79% Run. In 2002 Pass Percentage on First Down in the 4th Quarter was higher than run percentage. Every other year in the sample Run Percentage was higher. The 2011 total play count decrease is consistent throughout all quarters. So need to research the play counts for 2011 to see what is up. I enjoy running. I despise running on a treadmill. At least the gym I am a member of offers 6 TV viewing options in an attempt to cancel out the crapiness of running on a treadmill. Here is an analysis of the viewing options during today's lunch run. This is a totally arbitrary watchability metric I concocted out of thin air. Fox Local - Local 12:00PM news. At least the 12:00PM team is not as wonky as the 9:00PM team. You tune into the 9PM team because its a train wreck and you want to watch the show. Of course weather lady was indicating a chance for more snow this week so that knocked it down a bit. ESPN2 - First Take. There is only so much Chip Bayless one can take in a week. Since this was my second dreadmill run of the week I had reached my Chip Bayless quota for the month. However First Take finished second in the watchability rating barely eeking out a victory over Fox Local. Photo Stream - This is a photo stream of the various programs, trainers, and sevices offered at the gym. All of the photos are sized incorrectly to the 16:9 resolution ratio of the TV. So every picture and video is blurry and/or stretched. So annoying. Fox News - Ahh yes the typical right wing slanted news perspective. "Thanks Obama". I am a conservative but it is hard to watch this "news" outlet at times. Those times are most times. CBS - Bold and the Beautiful. I kid you not at one point on the closed caption it stated - Heather: [Heavy Breathing]. Heather was a 50s something blonde lady who looked more like a 70s something blonde lady. Guess that Bold in all actuality means Old, whereas beautiful does not mean beautiful. Of course that is a synopsis based on exactly 23 seconds of viewing. That was about all I could stand to look at. 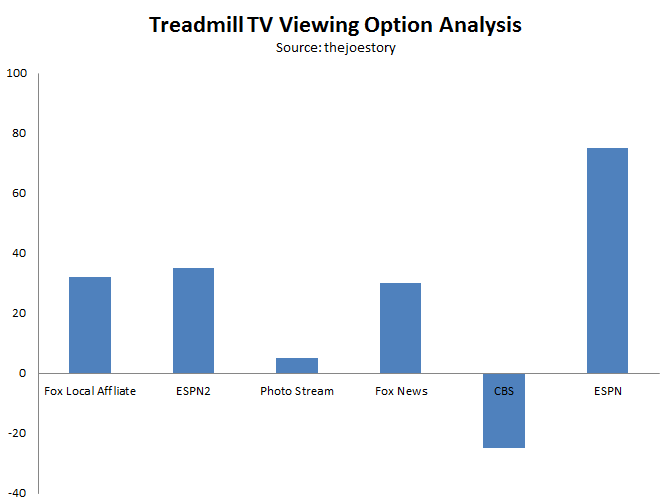 I'd rather run on a treadmill than watch that show, and that is saying something. ESPN - Sports Center. Can't really go wrong with Sports Center for a guy that enjoys watching and playing sports. Main problem is this TV was on the end so I had to turn my head. It is hard enough not to fly off a treadmill for me looking forward. Found a cool feature on IMDB today (probably an old feature, just finally stumbled on it). IMDB allows users to make lists of movies and shows. Several people have made all kinds of list. 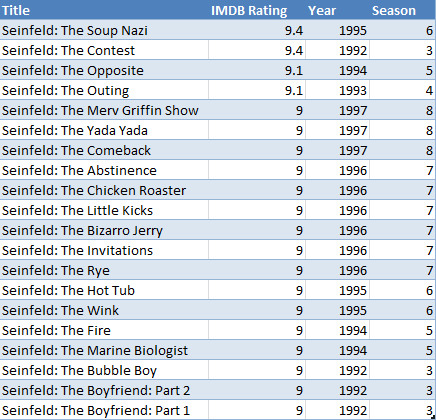 I stumbled today on the Seinfeld episode list. The best part about the list at IMDB is it provides a way to export the data to CSV. 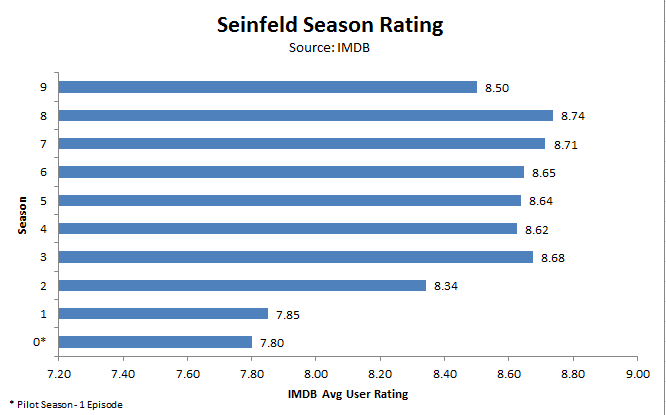 The export includes the IMDB rating score. I grabbed the CSV, imported it into SQL, and started running some queries. From there of course I made some charts in Excel. Pretty cool find. I am going to check out some more lists. You can create your own lists as well after creating an account. Should be fun. 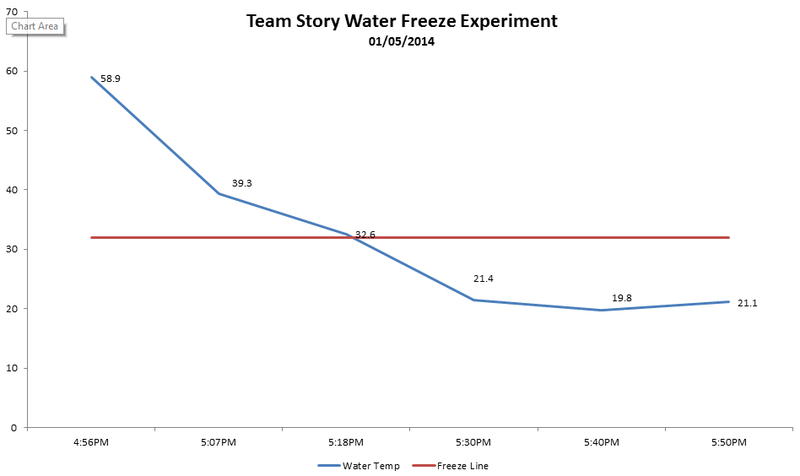 Team Story conducted a water freeze expierement this evening. We wanted to see how quickly some water would freeze sitting out on our front porch. We put two cups of tap water in a plastic cup, took temperature readings and recorded observations every 10 minutes. The outside temperature was 7 degrees above 0. Here is a chart showing the temperature trend.